Aby Watson is a Glasgow-based contemporary performance maker, facilitator, artist, and researcher. She is passionate about making complex, risk-taking and accessible performance for a wide variety of audiences. She does not believe that art is only for those with privilege. Aby’s research is practice-based and she creates both collaborative and solo works that experiment with movement, choreography, text, action and autobiography. She is predominantly interested in destabilising hegemonic norms in choreographic performance. 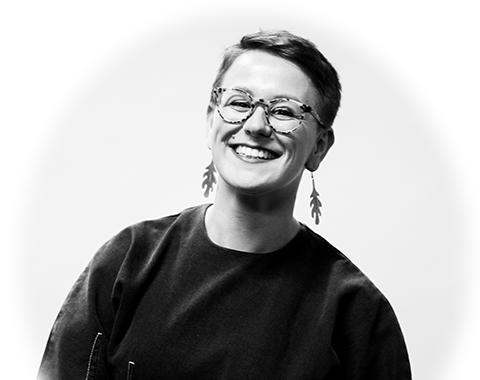 Aby is a third year part-time PhD student at The Royal Conservatoire of Scotland, where she previously graduated with a First Class (BA) Hons in Contemporary Performance Practice. She is proudly dyslexic and dyspraxic and its these identities which crucially inform her research. Her PhD study, Choreographing Clumsy: Dyspraxia and Choreographic Practice, aims to understand choreography from the perspective of people with dyspraxia, a specific learning difficulty (SpLd) that affects coordination skills, cognitive processing and the execution of movements. This study will be completed part-time over six years and will result in a new body of performance work derived from and embodying original research, and will be accompanied by a short thesis. This practice-based research project embeds dyspraxic-thinking traits into choreographic discourse. By placing dyspraxia within the field of dance, questions arise as to notions of value, expectation and (dis)ability within choreographic processes and performance. This new body of work will be created to address the invisibility and lack of dyspraxic choreographic voices functioning within the dance sector.